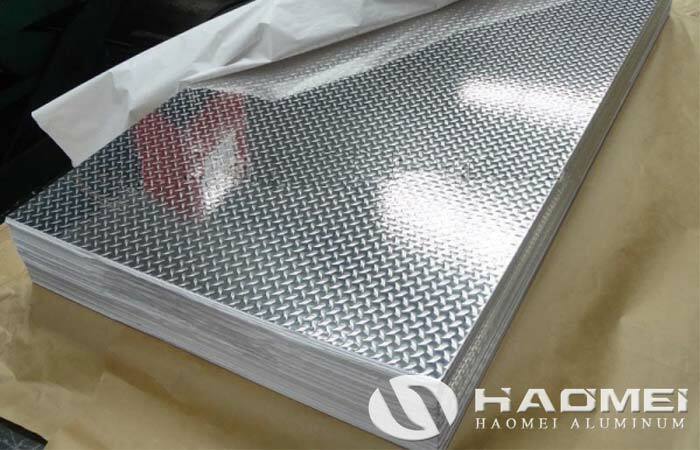 Aluminum tread plate refers to aluminum plate with textured pattern surface. according to purpose, aluminum tread plate is divided into two categories: exterior wall aluminum plate and interior wall aluminum plate. Among them, interior wall aluminum plate is mostly used for interior decoration, the aluminum checker plate for home decoration is generally used for ceilings in kitchens and bathrooms. Aluminum tread plate can also be divided into two kinds: single-sided patterns and two-sided patterns. Among them, double-sided pattern aluminum plates are mostly rust-proof high-strength aluminum alloy plates. Aluminum tread plate has the advantages of high strength, corrosion resistance, easy processing, and easy molding, which can improve work efficiency and shorten construction time. In addition, aluminium tread plate have numerous surface patterns, durable, easy to clean, so it is widely accepted by people, especially very popular in the construction and decoration industry. Aluminum tread plate is widely used in architectural decoration. For example, in the interior decoration, the aluminium tread plate can be used as non-slip plate, wall decorative plate, ceiling plate, etc. The specifications of the aluminum checker plate corresponding to different purposes are not the same. The thickness of the non-slip aluminum tread plate is generally 1-10mm, the width is 1000-1500mm, the length is 2000-3000mm, the thickness of the embossed aluminum plate is 0.1-0.9mm, the width is 500-1200mm, and the length can be cut to size. The common seen pattern is diamond plate and 5 bars, the common seen grade is 1060, 3003, 5052, and 5754. We Haomei Aluminum is welcome by customers who need aluminum tread plate because we always supply qualified product strictly according to the customers’ requirements, all specification available and cut to size.